Mr. Chairman and members of the Committee, thank you for the opportunity to speak to you today on the impact of higher marginal tax rates on pass-through businesses. America’s entrepreneurs are facing tremendous uncertainty, thanks to the stalled economy and the impending expiration of the Bush-era tax rates at the end of this year. While there are many in Washington who believe that allowing top marginal tax rates to jump from 35 percent to 39.6 percent will have a minimal impact on pass-through businesses and the economy, this view is badly mistaken. The issue is not how few businesses will be impacted. The relevant economic question is how much business income will be hit with higher tax rates. No matter how you parse the data, the evidence is clear that the vast majority of pass-through business income is earned by high-income taxpayers and they would be disproportionately impacted by such a tax increase. Indeed, past Tax Foundation research determined that nearly 40 percent of any new tax revenue raised by boosting the top two tax rates would come from the top 2 percent of private businesses. These are the most successful, growing, and profitable firms that are key to America’s economic recovery. In every sense of the word, this would amount to a “Success Tax” on our best and brightest entrepreneurs. The implications of allowing top marginal tax rates to rise are considerable because of the tremendous growth in non-corporate business forms over the past thirty years. Today, there are vastly more non-corporate businesses than traditional corporations and they now earn more net income than traditional corporations. Thus, an increase in the top individual tax rates could mean a substantial tax hike on a broad swath of private, or non-corporate, business income. The economic evidence suggests that this would be very detrimental to the country’s long-term economic growth. Indeed, OECD economists have determined that high personal income taxes are second only to corporate income taxes in their harmful effects on long-term economic growth. As is now well known, the U.S. has the highest corporate income tax rate among industrialized nations. However, it is not well known that the U.S. has the most progressive personal income tax system among industrialized nations. What that means is that the top 10 percent of U.S. taxpayers pay a larger share of the income tax burden than do the wealthiest decile in any other industrialized country, including traditionally “high-tax” countries such as France, Italy, and Sweden. What are the harmful effects of progressivity? The economic evidence is quite clear that there is a “non-trivial tradeoff between tax policies that enhance GDP per-capita and equity.” Meaning, the more we try to make an income tax system progressive, the more we undermine the factors that lead to economic growth – investment, risk taking, entrepreneurship, and productivity. After extensive study of the impact of tax reforms on economic growth across the largest capitalist nations, OECD researchers determined that “a reduction in the top marginal [individual] tax rate is found to raise productivity in industries with potentially high rates of enterprise creation. Thus reducing top marginal tax rates may help to enhance economy-wide productivity in OECD countries with a large share of such industries…” The U.S. is once such country with a large share of entrepreneurship and non-corporate businesses. Thus, the economic evidence suggests that cutting our corporate and personal income tax rates while broadening the tax base would greatly improve the nation’s prospects for long-term GDP growth while helping to restore Uncle Sam’s fiscal health. More importantly, these measures will lead to higher wages and better living standards for American citizens. And that should be priority number one of any policy. To understand the impact of higher tax rates on business income, it is instructive to look at the tremendous growth in taxpayers reporting business income over the past three decades as sole proprietors, S corporations, limited liability corporations (LLCs), and partnerships. These non-corporate firm types are often referred to as “pass-through” entities because the firm’s profits are passed directly through to the owners and taxed on the owner’s individual tax return. By contrast, the profits of traditional C corporations are taxed at the corporate level first before being distributed to the owners (shareholders) who are then taxed again at the individual level. Between 1980 and 2008, the total number of pass-through businesses nearly tripled, from roughly 10.9 million to 31.8 million. Specifically, as Figure 1 indicates, the number of sole proprietors grew from 8.9 million to 22.6 million, while the number of S corporations and partnerships (which include LLCs) grew from 1.9 million to more than 7 million. Meanwhile, the number of traditional C corporations declined steadily from 2.2 million to 1.8 million between 1980 and 2008. 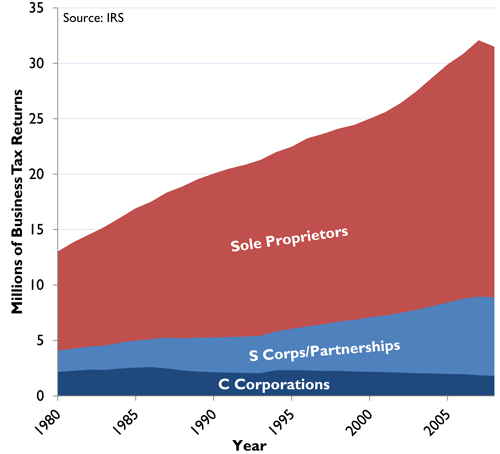 The popularity of C corporations as a business form ended by the late 1980s when they were exceeded in number by S corps and partnerships. These alternatives to the C corp have continued to grow at such a rapid rate that there are now three and one-half times as many S-corps and partnerships as traditional corporations. Over time, as these pass-through firms grew in number, size, and profitability, they began to collectively generate more net business income than traditional C corporations. 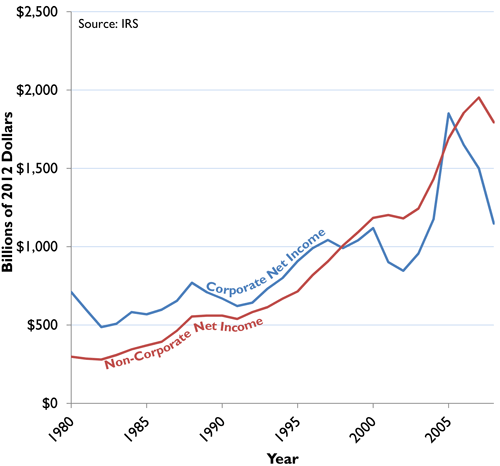 Figure 2 compares the growth in net income for all pass-through businesses to the growth in net income for all C corps between 1980 and 2008. After adjusting for inflation, net income for C corps roughly doubled during the period, from $752 billion to $1.4 trillion in 2005, and then collapsed to roughly $1.1 trillion in 2008. By contrast, the combined net income from pass-through businesses increased six-fold, from $315 billion, after adjusting for inflation, to more than $1.8 trillion in 2007, before settling to $1.7 trillion in 2008. In 1998, the combined net income of pass-through businesses exceeded those earned by C corps for the first time and, except for 2005, have remained above C corp net income in every year since. Indeed, in 2008, the net income of pass-through businesses comprised 61 percent of all net business income. It is also interesting to note the relative stability of pass-through business income to the volatility of C corp income. The period between 1999 and 2008, shown on Figure 2, is a good example of how volatile corporate income can be. After the tech bubble burst in 2000, C corp income plunged 24 percent over the next two years, after adjusting for inflation, and then rebounded 119 percent by 2005. After this temporary peak, C corp income fell again by nearly 38 percent over the next three years. By contrast, pass-through income has not gone through such wild gyrations. After the tech bubble burst in 2000, pass-through business income actually increased in 2001. In 2002, net income fell by just 2 percent but then rebounded by 5 percent in 2003. In the four years after the 2003 tax cuts, the net income of pass-through businesses grew by nearly 60 percent, after adjusting for inflation. In 2008, pass-through business income exceeded C corp receipts by 56 percent. It is often assumed that a tax increase on high-income individuals will have little impact on business activity because only 2 or 3 percent of taxpayers with business income are taxed at the highest rates. While it is true that there are a small number of high-income pass-through businesses, the more economically meaningful statistic is how much overall business income will be taxed at the highest rates. There are a number of ways to measure this. 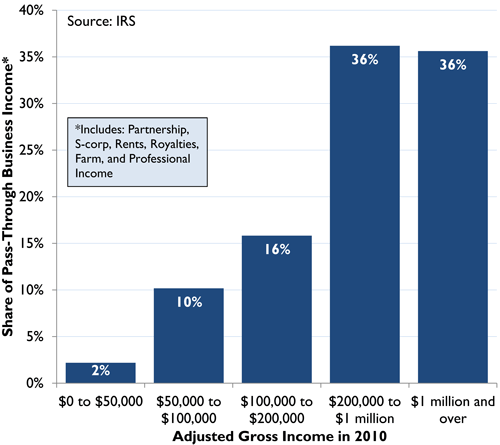 How this breaks down by income groups can be seen in the most recent IRS data for 2010. In that year, individual taxpayers reported $693 billion in total net business income from all sources—including business and professional income, rents and royalties, partnership and S corporation income, and farm income. As Table 1 and Figure 3 illustrate, nearly three-quarters (72 percent) of this pass-through business income was reported by taxpayers earning more than $200,000. Millionaire tax returns earned 36 percent of all pass-through business income while taxpayers earning between $200,000 and $1 million also earned 36 percent. Meanwhile, taxpayers with incomes below $100,000 earned 12 percent of all pass-through business income. It is also illuminating to look at the distribution of specific types of business income. Table 1 shows the very different distribution of income generated by sole proprietors (business and professional income) versus the income generated by partnerships and S corporations. Whereas 31 percent of sole proprietor income is reported by taxpayers earning over $200,000, the overwhelming majority of partnership and S corp income is reported by these high-income taxpayers. Indeed, more than half of all partnership and S corp income is earned by millionaire taxpayers. Of keen interest to policymakers is how many of these pass-through businesses are employers. A recent Treasury report analyzed IRS data from 2007 and found that roughly 4.2 million pass-through business returns—out of 34.7 million overall—were employers. As Figure 4 illustrates, 50 percent of the income generated by these employers accrued to taxpayers with incomes above $1 million. Fully 90 percent of this business income was generated by employers with incomes above $200,000. During this nine year period, about 675,000 taxpayers earned over a $1 million for at least one year. 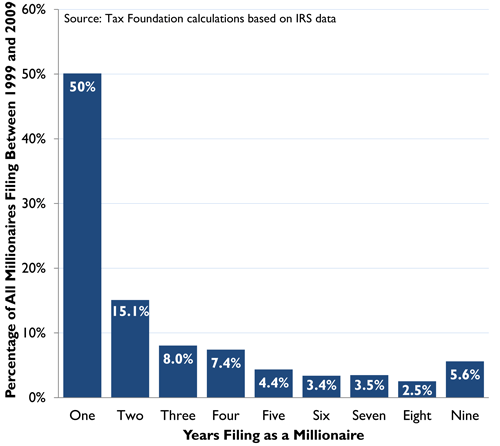 As Figure 5 shows, of these taxpayers, 50 percent (about 338,000 taxpayers) were millionaires for only one year, while another 15 percent were millionaires for only two years. By contrast, just 6 percent (38,000 taxpayers) remained a millionaire in all nine years. 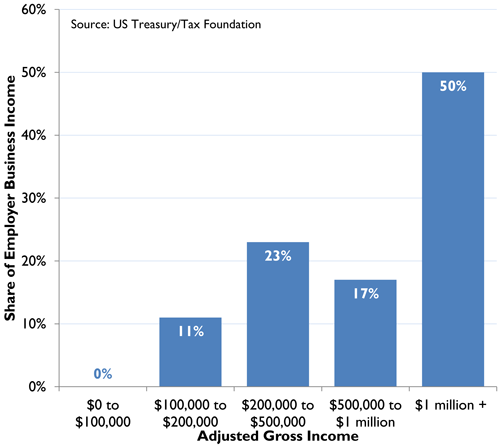 Based on these results, it is clear that taxpayers move in and out of millionaire status with great frequency. The volatile nature of capital gains realizations and business income appear to be the leading factors for the transiency of millionaires. How Much Would a Tax Hike Cost Successful Businesses? The key question is, what is the ultimate impact of raising the top two tax rates on the most successful pass-through businesses? Tax Foundation economists measured this cost in 2010 when the Bush-era tax rates were first set to expire. They found that assuming that business income is the last dollar of income taxpayers earn, that 39 percent of the total tax increase on high-income taxpayers would be extracted from business income. According to the most recent revenue estimate from the Joint Committee on Taxation, the revenue gain from increasing tax rates on taxpayers earning over $250,000 would raise $966 billion over the next ten years. Assuming that the Tax Foundation’s earlier 39 percent estimate still holds, this means that roughly $377 billion of these new revenues would come from successful pass-through businesses. As lawmakers consider policies to improve the competitiveness of American businesses, they should not forget that individual income tax rates are just as important to business activity as the corporate rate. The various proposals to raise income taxes on high-income earners, either by increasing the top marginal rate, closing “loopholes,” limiting deductions, or implementing a minimum tax, would fall very heavily on America’s non-corporate businesses. These flow-through businesses account for a large percentage of business income and employment in the United States. Raising taxes on them at this time could curtail their hiring and other investment plans, further delaying economic recovery. Asa Johansson, Christopher Heady, Jens Arnold, Bert Brys and Laura Vartia, “Tax and Economic Growth,” Organization for Economic Cooperation and Development, OECD Economics Working Paper No. 620., July 11, 2008. p. 43. “Growing Unequal? Income Distribution and Poverty in OECD Countries,” Organization for Economic Cooperation and Development, 2008. p. 112. http://dx.doi.org/10.1787/422013187855. Here income taxes refer to both personal and social insurance taxes. Tax Policy Reform and Economic Growth, OECD Tax Policy Studies, No. 20, OECD Publishing (2010), p. 22. “Tax and Economic Growth,” p. 9. When we reference tax return data, business income is considered the sum of income reported on schedules C, E (excluding royalty and estates), and F. For the data source, see: http://www.irs.gov/pub/irs-soi/80ot1all.xls. Memorandum on Revenue Estimates to Finance Committee staff, from Thomas A. Barthold, Joint Committee on Taxation, June 18, 2012. 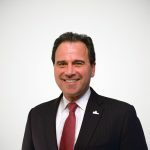 Scott A. Hodge, “Over One-Third of New Tax Revenue Would Come from Business Income If High-Income Personal Tax Cuts Expire,” Tax Foundation Special Report No. 185, September 2010.